So while I'm putting the finishing touches on Carolina, I'm already thinking ahead to my next project. And this is it, Coastal Lily by Minick and Simpson. I know what you're thinking, "Thelma, another lily quilt?". Yes, another one! Even though I'm just finishing one lily quilt, I'm in the mood to start another one. For some reason I just can't get enough of these bloom blocks. This pattern doesn't have a date on it but I don't think it's a new pattern. The fabric Minick and Simpson used for their Coastal Lily is Wiscassat, I think that fabric was released in 2007. 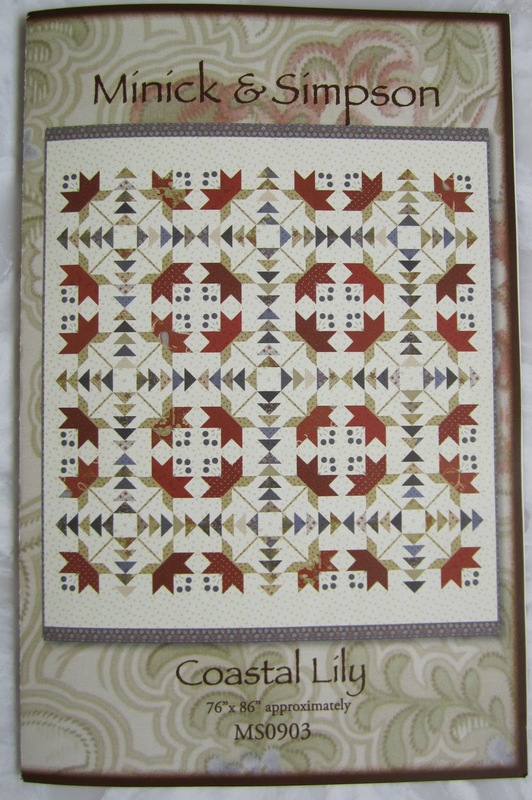 The good news, the paper pattern is still available from Minick and Simpson, click here for more information. So even though I'm doing back to back lily quilts, this lily quilt will have a totally different feel than Carolina. For one thing, one bloom block in Coastal Lily is 10 inches, that's a big bloom, 3 times bigger than the blooms in Carolina. I'm going to use fabric from my happy bins for Coastal Lily, and that fabric has more of a modern feel to it, but I think it will suit this pattern perfectly and also give it a different look. I spent the better part of yesterday selecting my fabric, and even though it was a rainy day, just playing with that bright fabric made me happy. I'm going with a different fabric for each bloom. For the leaves I'm going to use that stack of grays. For the geese I'm going to use those grays and add navy. The blossom berries will also be navy. A lot of the fabric is from Bonnie and Camille's newest released line Happy Go Lucky by Moda. If you were thinking about doing a lily quilt, but were a little scared off of Carolina by my constant talk of those fussy points and seams, you may like this pattern better. First off, those bloom points float, you don't have to worry about cutting them off when piecing the blocks together. Also, the stems, ARE PIECED, not appliquéd, that's really appealing to me right now. 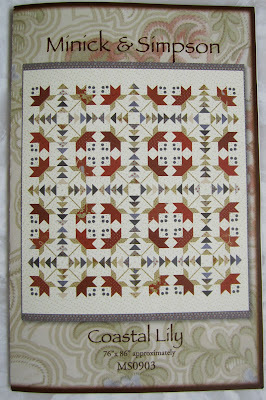 And finally, no border to speak of, you really don't need any yardage for this pattern. I think any type of fabric would work for this pattern, I think this pattern would look good with totally scrappy traditional fabric, or any 3 Sisters, Minick and Simposn, Bonnie and Camille, Fig Tree, or even French General family of fabric. Really, any fabric you've got laying around your sewing room would work. Maybe this is just the pattern you need to make your own lily quilt! Come on and join me, couldn't you use a few blooms in your life? Thank you for your very interesting blog. Yours is one of my very favorites. Love the happy fabrics you've selected. What color background are you using? This is a really great pattern. I love Minnick and Simpson designs and have a few. I'll have to look for this one! Oh this sounds beautiful, I am really looking forward to seeing it come together. Great color choices. I love this pattern - and love your fabric choses. So different from your Carolina quilt. I love this pattern too! The fabrics you have chosen are wonderful. I love anything by these designers. Have a wonderful weekend. Oh myThelma...."Coastal Lilys" are just so nice looking and yes, different from the "Carolina" pattern but jsut as nice. You have such great color choices and and can't wait to see the start of this. I think I am going to get started on the "Carolina" ones but this might change after seeing this pattern. I could absolutely positively use some blooms in my life so I think you should give me your quilt when it's done! Have a terrific Memorial Day weekend! I have been in lust with this pattern since it came out! I love the flying geese mixed with the lily's. You might just give the the nudge I need Thelma! Nice fabric choices, Thelma. I'll add a Lily quilt to my list...the list of patterns to try AFTER I complete some UFOs. It's going to be a terrific quilt and I can't wait to see the first block! Your choice of fabrics will be great and give your quilt a very different feel to both Carolina Lilly and this original pattern. I won't Lilly along with you, but will follow your progress eagerly. Are you a finish one project before you begin another type of person? I admire that, but am definitely not one of those. I get inspired to start something new, so I do. Quilting ADD I've heard it called. That's me. I flitter and flutter between projects, working on whatever makes me happy at the time. No other area of my life is like that, very structured and organised, routined, so maybe that's why? I like to keep my hobby satisfying and not full of self imposed discipline and rules. In the Beginning of Quilting, I was struck by the Carolina Lily. Never made it but must now that I've seen yours (also 'cause my only 2 Gkids live in N.C. now. I'll be deciding between yours and Minick & Simpson's. Oh in brights!! How fun and I can't wait to see your first few blocks.